Dwaraka Plus boutique is all about art and Kalamkari products. If you're the artsy sort, then it's a slice of heaven with bags, fabric and home decor with this art. If you’re someone who is fond of art and artsy products, Dwaraka (Development of Weavers and Rural Artisans in Kalamkari Art) is for you. Everything in this quaint boutique located in Sadashivnagar, is inspired by the Kalamkari art form. As the name suggests, Kalam (pen) and Kari (craftsmanship) hand painted with only natural dyes, every product is imprinted and inspired by this art form which is around 2500 years old. What’s even more lovely is that, all the products in this boutique are produced by the people of an NGO. Dwaraka is a Not-For-Profit initiative of Ramanarpanam Trust. All the proceeds from the sale go to the trust and into further production of their vibrant collection of products. This store is filled with handicrafts, and all things completely handmade. 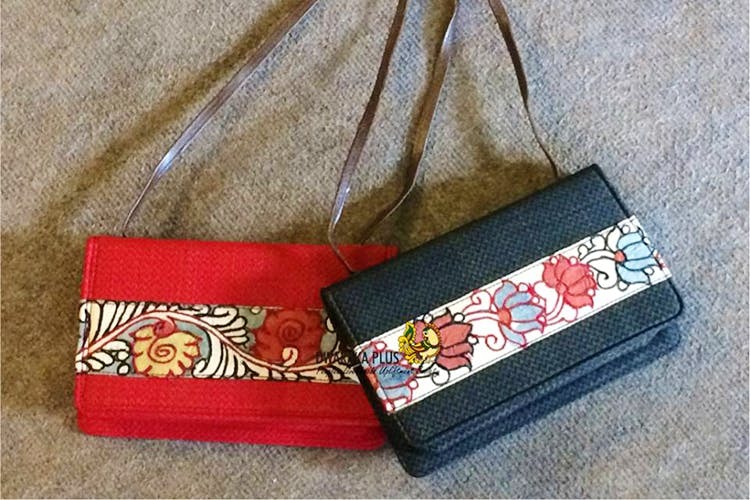 Handbags, textiles, stationary, décor, everything is painted with Kalamkari, earthy and elegant looking. We absolutely loved the scarves and stoles collection. The décor pieces mainly comprising of wall art makes for a lovely addition in your drawing room.